Are You Ready to Have a Panic Attack About the Earth? Just in time to celebrate Earth Day, a survey has revealed that approximately 93 percent of the Great Barrier Reef has been hit by coral bleaching, an event of unprecedented severity that scientists say will likely lead to the death of a significant percentage of those reefs. “Loomis Reef was an amazingly diverse, beautiful little reef about 500 meters long—covered in lots of different coral. Now it’s going to be a big ball of slime,” Marshall said. The Guardian reports that water temperatures in the Great Barrier Reef in February and March of 2016 were the hottest on record. And despite the clear connection between climate change and coral bleaching and the equally clear connection between burning coal and climate change, Australia’s government recently approved the Carmichael mine, which would become one of the world’s largest coal mines. As our sister site Gizmodo has reported, coral bleaching occurs as a reaction to unusually warm ocean temperatures. When the water gets too hot, coral—a highly sensitive symbiotic organism that is part plant, part mineral, and part animal—expels its zooxanthellae, the algae it relies on for food, and turns white. If temperatures don’t cool, the coral dies. According to the New York Times, scientists believe that more than a third of the world’s corals are threatened by this mass bleaching crisis, only the third such mass event in recorded history and by far the worst. “We are going to lose a lot of the world’s reefs during this event,” C. Mark Eakin of NOAA told the Times. Researchers say that the latest El Niño is to blame, exacerbated by the warming effects of climate change; corals are dying from the Great Barrier Reef to reefs in Madagascar, Guam, Hawaii, Indonesia, and the Florida Keys. NOAA has predicted that this bleaching event, which began in 2014, could extend well into next year. The NOAA coral scientists point out that reefs that bleached in 2015 in the Caribbean and Florida Keys have just started to recover, but may start bleaching all over again as early as July. Eakin also notes that in the Pacific, corals in Fiji’s nearshore waters are bleaching with lots of dead coral for the second consecutive year, and could be worse than last year. 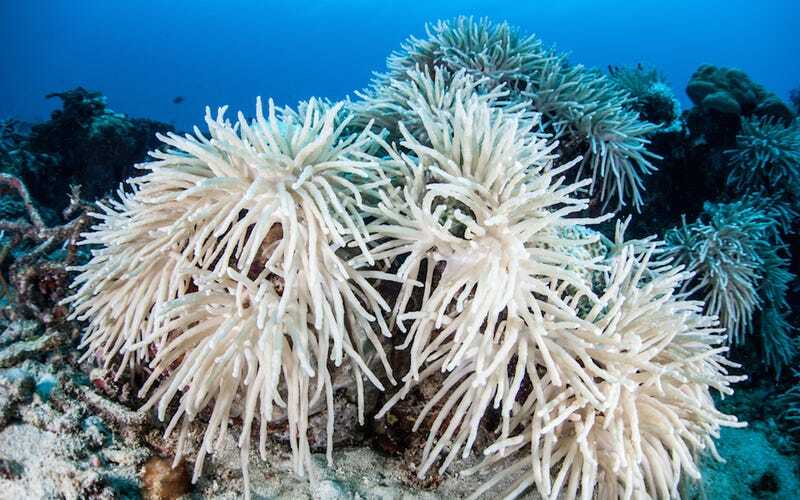 Also, as bleaching events become more frequent, some reefs may not have time to recover. In 1998 in Southeast Asia, severe bleaching was followed by twelve years of recovery that allowed some of the more rapid growing, branching corals to grow back. However, the slower growing corals that build the backbone of reefs did not recover. In 2010, the same area was hit again, killing off newly grown branching corals and many of the surviving massive corals. These reefs may see bleaching again later this year. And of course, coral reefs are much more than beautiful miracles of biology that are cool to look at—reefs are home to 25 percent of all marine life, and they support an ecosystem of fish that feeds more than one billion people and employs more than a million small-scale fishers in the Philippines alone. To put it lightly, the world is not prepared to operate without them. Scientists in Hawaii have begun experimenting with “super corals,” an assisted evolution strategy in which strains of coral that are resilient to acidification and higher temperatures are bred with one another; the idea is that they will eventually be introduced into existing reefs facing bleaching.